Here you do not see a protest for more rights or political posts. ‘We want what was ours’, and ‘we want it back’. At every turn, people in the crowd cry their presence . Everything is ready to explode again. Leader Khamenei intervenes, analyses, leads and gives orientations almost every day. 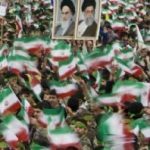 Backed up by the Iranian military, its militias and paramilitaries as well as the popular organisations, he focuses attention on the aim to have at every moment. There are explosions of joy in the crowd. People feel that the time has come to stand up and stop moaning about what goes wrong. Expect new eruptions. The volcano is about to spew out what has stayed for too long on the chest of the Islamic Revolution. How many people are in the streets of the whole country? No one knows, and it does not matter. The important is the quality of this movement, this big festive rebellion and its meaning. It wants to break with imperialism and its internal lackey, the government of multimillionaire Hassan Rouhani. The polarisation of the world reflects itself in Iran. It expresses itself less militarily (as in Syria) than in the dismemberment of the government’s structures . These structures are being sold to liberalism, financial capitalism, the free market and the world integration of capitalism. This massive demonstration amounts to an occupation of the public spaces. It is also a war declaration on imperialism and its threats. People have come concretely to get at the Rouhani government; a government working in the interests of imperialism, whose policies do ruin the conditions of life and work of the people. Such a retreat from the Ahmadinejad’s years! Iran is not a country of unfathomable Eastern mysteries. It is a country shaken to the core by its massive social revolution and national revolutionary Islamic faith. No analyst, journalist or Western commentator understands any of it. They all flap around in the mist of Iran’s complex processes. The latter are very uneven, as well as constantly combining and making rapid turns. Nothing comes out of nothing. The roots of the Revolution go back a long way, well beyond the geographical limits of contemporary Iran. The engines for the present Islamic movement have been hundreds of years in the making, driven by the Islamic faith in social justice that made the Revolution possible in 1979. No base coup, no treason and no lack of mass organisation prevented this movement from surfacing again and again, each time more attuned and combative. This is what happens today to the surprise of some, and to the great disappointment of others for whom the people should stay divided and ignorant, in a country submitted to imperialist and capitalist globalisation. Almost all popular actions are prepared beforehand in Iran. This gets done through meetings in the Mosques and the Friday Prayers. Orators denounce, sometimes arms in hand, the privileges, the abuses, the blackmails and the plots. There are no other instruments of mass organisation. There is no class Party beyond corporatist trade unions. No class is clearly formed and structured in Iran. Because the organised industrial workers tend to live at a distance from centres, they have few opportunities to weigh directly on the other social layers, particularly where the means of information are parsimonious and selective. The State institutions are not well structured either. Masses living on rural lands are evicted from their properties by speculators. The social properties are privatised too. They pass from the hands of the agricultural workers to those of new land, sugar and water sultans. The land registries are badly updated and not computerised. Due to inflation, land-renting contracts are only for one year, making it impossible to locate families in constant displacement. An up-to-date property registry is wanted for the good operation of elections and legal procedures. It is necessary above all to help the social formation and structuring of the Revolutionary State. It is necessary for the State to use its full potential and ability to advance in the direction social change and Socialism. The absence of centralised information allows vast smuggling networks to devastate the national industries. The agricultural products deemed in surplus to requirement are exported in this way, with the dollar revenues not returning to the country. A minister said so when he attacked another! The country’s statistics are useless and contradictory. They record inflation well below what people experience in daily life. To justify this, the government says that lower inflation does not mean lower prices, but prices rising less fast. Due to the destruction of industry, and of the internal market, unemployment keeps growing. In Iran, the ‘Open Veins’ are all the imports: white goods, cars, trains, rails, textiles, shoes, clothes, etc. These enter the country through being cheaper than what Iran produces. In the country, this causes production to be stalled, bankrupted or working below capacity. Ahmadinejad, president of Iran 2005-2013. The effects are devastating. The permanent labour contracts are only 5% of the total. When he was president, Ahmadinejad worked vigorously for redress in this matter. Now, the public-sector jobs are at the mercy of foreign private enterprise. About two years ago, gold mines were franchised to foreign companies. Although already on a 12month contract, the workers were sacked prematurely to stop them receiving their bonus. Some of them committed suicide. Others who decided to block a motorway were rounded up, arrested, repressed with 75 lashes and condemned to 5 years in prison. That Iran belongs to the World Trade Organisation made no difference. The Rouhani government tells foreign companies to come to Iran and invest anywhere, anyhow, sometimes offering up to 100% of installation costs. This happened at the most important public petro-chemical complex. Similar deals were also proposed to European enterprises. The government passed a contract with Turkey for the construction of 3 major power stations, but the resulting electricity is earmarked for export to Turkey. That country has already been offered the infrastructure, the gas at very low price, and a low-paid and non-unionised work force. Exporting this electricity is one of the most absurd, stupid, anti-social and self-destructive things! The water to be used will come from deep aquifers that can no longer supply the ancient underground canals. In this arid and semi-arid country, the excessive use of this water has destroyed agriculture. 70% of the former agricultural producers have been pushed towards the towns where they go in search of occasional jobs. The European countries started buying their gas from Iran when they fell out with Russia due to competition or the Ukraine crisis. So much was exported that Iran is now short of the gas it needs to pump back into the wells to extract the oil. This has contributed to a 20% reduction in oil production capacity, as well as inflicted damage on the refineries and on the sale of crude. Now, and in spite of all the goodies offered to the European capitalists, these are in no hurry to proceed. Perhaps they dare not invest in Iran. Worse happened when the army and the Guardians of the Revolution were told by minister Zangueneh that they would no longer be allowed to buy oil from the State. The Iranian military could do this in the past, to re-sell the oil and modernise its arsenals. Zangueneh decided to stop this because, he said, “the Americans don’t agree”. In the last few days however, parliament forced the government to increase the military budget by 5%. Iran’s negotiations with Russian enterprises are not progressing. The plan to buy Russian tanks and the hunter-plane Sokhoy is halted. The same goes for the construction of two additional plants at the Bushehr nuclear processing plant where more electricity can be produced to de-salinise sea-water and irrigate arable lands. 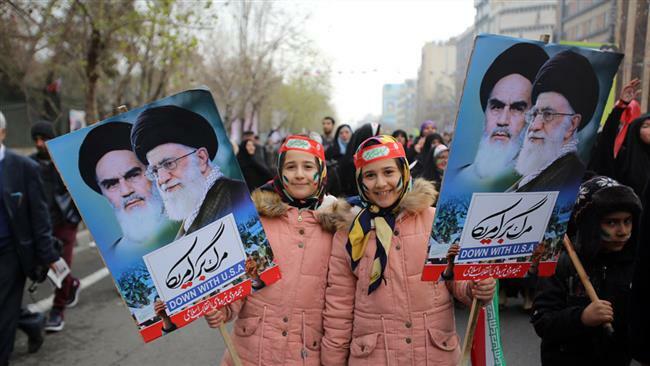 Khamenei keeps calling for “an economy of resistance with concrete facts and concrete steps”. With this government however, everything is mired in delay, muddle and confusion to stop the elevation of this powerful revolution. The idea is to hold back the formation of an energised and strong structure with a centralised leadership determined to bolster the Revolutionary State. This is the fourth year of the Rouhani liberal government. The standard of living for people nosedives, along with purchasing power and the national currency. At the time of the nuclear accords, this government kept the country in the expectation that embargoes would be lifted and that foreign investments would come. Meantime however the internal connections and the brickwork of the economic edifice were being dismantled. So strong was becoming the popularity of Putin in Iran that the State TV stopped reporting about Russia bombing Daesh. People would press against each other to watch him, and listen to the good news. Iranian volunteers decided to go and intervene in Syria alongside the Guardians of the Revolution and the Iranian military chiefs. In alliance with Russia, they went to support the Syrian government and the Syrian military. Now they intervene with great firmness in Syria to defeat the plans of the imperialists. Such is the context of this anniversary of the Iranian Revolution. It is being feted with explosions of joy, with sentiments of victory, with cries of determination. What is falling by the wayside is Rouhani’s hope that he can continue being complacent and benevolent towards the United States. The masses are beginning to rise, full of self-confidence, with the dignity of feeling that they are the true protagonists of the State. People demonstrated this year much more massively than they did in previous years. You could see young people, women and everybody, from the one-year old baby to the elderly men in their wheel-chairs. The cries of people in the crowds resounded like plebiscites against imperialism and its sidekicks. People feel bound to the continuation of the struggle against imperialism. They want the government to admit that it failed with its nuclear accords. They want the nuclear activities re-started. The slogans they were shouting in this demonstration were absolutely anti-imperialist, anti-US, anti-UK and anti-Israel. Ali Khamenei made fun of Trump “who helps us to show the real face of America”. 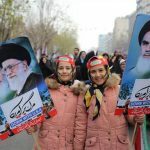 The slogans shouted by the crowds did not have a social character, but the pictures of Khomeini and Khamenei that they carried claimed their social, political and revolutionary engagement. 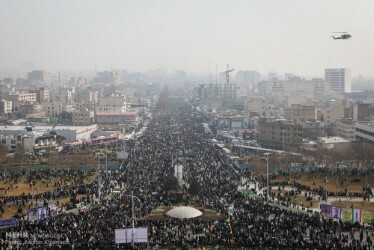 The presence of Ahmadinejad in the demonstration had a great importance. He was the only personality to mingle freely with the crowd without bodyguards. In reality, he was protected by the care and attention of his supporters. Many were those carrying his portrait too, alongside those of Khomeini and Khamenei. Immediately after the demonstration, the president of the Iranian National Security Council, the general Shamkhami, met his Russian counterpart and said: “Iran and Russia must be completely together in support of the of the Syrian government and army [..]. These relations are strategic ones”. This is the same general Shamkami that the head of the Russian army criticised previously for his weak determination to defeat Daesh. Let us not forget that originally, the Iranian government has stopped the Russian planes using the Iranian base of Hamedan (North West of Iran) in the very middle of the war for the liberation of Aleppo. This change in Shamkami’s stance shows that the will of the Iranian people is weighing strongly. 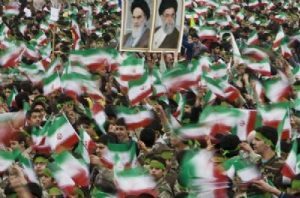 As much in Iran as everywhere else, there will be cowards trying their best to avoid or complicate the true process of revolutionary organisation. Today, this true process demands unity with Russia. Russia has recovered the use of Hamadan. The complete freedom of Russia to use Iranian airspace is of strategic importance. It is needed to organise the war against the imperialist forces gathered in Syria and Iraq. Those in the Iranian government and parliament who wanted to curb Russia in the name of ‘national sovereignty’, have been beaten at this point, on this important point of strategy. ‘Grand Ayatollah’Ali Khamenei, born 4.6.1989. He is the present Head of State in Iran. Hassan Rouhani: Born 12.11.1948. Became the 7th President of Iran on 3.8.2013. Donald Trump speaks of reversing Obama’s settlement over the nuclear deal, for instance. The ‘Open Veins’ refers to the book by Eduardo Galeano (a Uruguayan writer) who wrote “The Open Veins of Latin America” in the 1970’s. The author refers to five centuries of the pillage of a continent (Latin America) by imperialism, and the development of “structures of plunder” responsible for poverty and under-development in the subjected parts of the world. The Mining Journal of 23.9.2015 reports that gold is mined in Takab Azerbaijan, Iran. There is also gold mined in the city of Saqquez in Western Kurdistan. In 2014, gold started being mined in Zareh Shuran, Western Azerbaijan. The plant there is the biggest in the country, 35 km from Takab. It employs 1,250 people. The National Petroleum Company (NPC) was founded in 1964 in Shiraz. NPC is the second largest producer and exporter of petrochemicals in the Middle East. Bijan Namdar Zangueneh, minister in many Cabinets since 1979. Oil Minister under Rouhani since 15.8.2013. The Bushehr Power plant is 17 km away from the city of Bushehr, near the Persian Gulf. It was started in 1975, and was partially damaged by Iraqi air strikes in the 1980s. Russia helped its reconstruction in 1995. Ayatollah Sayyid Khomeini (1902-1989) led the Islamic Revolution in 1979. In office 3.12.1979 to 3.6.1989. Ali Shamkhami, born 28.9.1955, Secretary of Supreme National Security Council of Iran. Started in office on 10.9.2013 under Rouhani.